In 2016, the Raspberry Pi Foundation sold their ten millionth Raspberry Pi, and to celebrate, they released the Raspberry Pi Starter Kit, a collection of their "own idea of what the perfect bundle would look like." 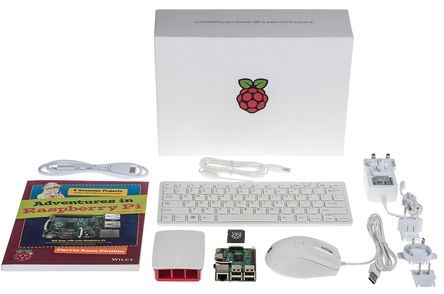 The kit includes a Raspberry Pi 3, mouse, keyboard, case, power supply with a set of international power adapters, HDMI cable, SD card, and an instructional book on coding for the Raspberry Pi. The kit is available from various suppliers for $130/£99. PJRC offers a number of 8-bit and 32-bit Teensy boards based on the Atmel AVR and Cortex-M4 processors. These small boards have minimal footprints (1.2x0.7 to 2.4x0.7 inches), can use Arduino software and libraries, and come with the Teensy Loader (in GUI and command-line versions) for downloading and executing your programs on the boards and other software development tools (e.g., WinAVR C compiler; Teensyduino, an add-on for the Arduino IDE). The PJRC website has specs, hardware and software add-ons, and use examples. Boards range in price from $10 to $30. News on Eben Upton’s CBE, a Rasp Pi IoT contest, the BeagleBone Green Wireless, and more!